It’s that time of the year when teams and fans alike have the highest hope for the future so now is probably a good time to remind readers about the importance of managing expectations. 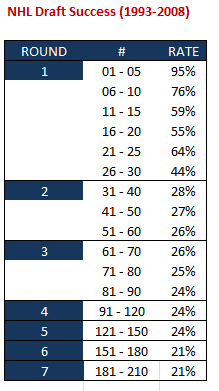 In a typical draft year, the talent drops off the table after pick 25 and then again after 30 where 70-75% of all 2nd and 3rd Round picks will ultimately fail to play at least 2 years in the NHL. I’m sure most Habs fans have scoured the various and often glowing scouting reports on darn near everyone, possibly even paying for some so let’s look at the how many actually make The Show with at least some measure of success from 1993 to 2008. As you can see from the chart below, there's a success spike in Round 1 picks 21-25. That’s typically the domain of small/slight but talented players, Europeans and goaltenders. Beyond that, the major drop starts as early as Round 2. Fortunately, The Habs still have Trevor Timmins who’s done well in the last decade with his 2nd round picks, hitting well above the league average finding NHL talent. In preparation for what appears to be the strongest NHL draft the QMJHL has had in a very long time, GM Marc Bergevin has quietly spent more time than many of his Canadiens predecessors personally scouting the Q to see for himself what his scouts are telling him. With 9 picks tomorrow, I fully expect the Habs will dip into the Q for 3 or 4 players, something that hasn’t happened in a decade, not because Bergevin wants to restock the “local quota” but because it’s a bumper crop for the QMJHL and he seems determined that the Montreal Canadiens should know that league better than anyone. And they damn well should. As for organizational needs, the Habs need to restock the cupboard at left wing, center and goal. With picks 25, 34 and 36, I expect they’ll take the best forwards available and it’s a good year for drafting left wingers. With pick 55, I expect they’ll go after a goaltender and from pick 86, 116, 176 and 206 they’ll shift to the best player available, no matter the position. 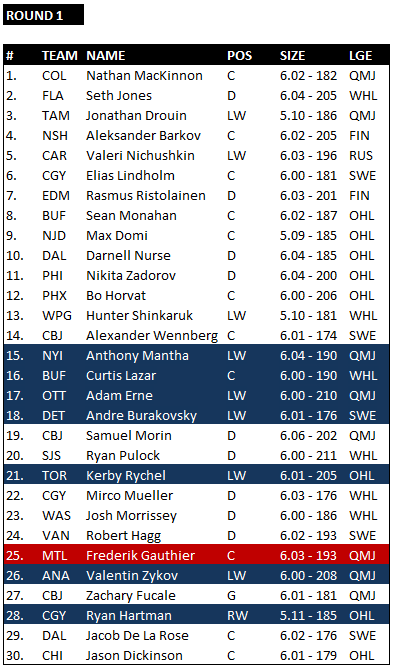 Bergevin will keep a close eye on who starts to drop in Round 1 and with a cluster of picks, the situation is ripe to trade up 5-7 spots to get their guy, if need be. As for jumping up higher than that, I have great difficulty imagining that Bergevin would be willing to pay the heavy price required. 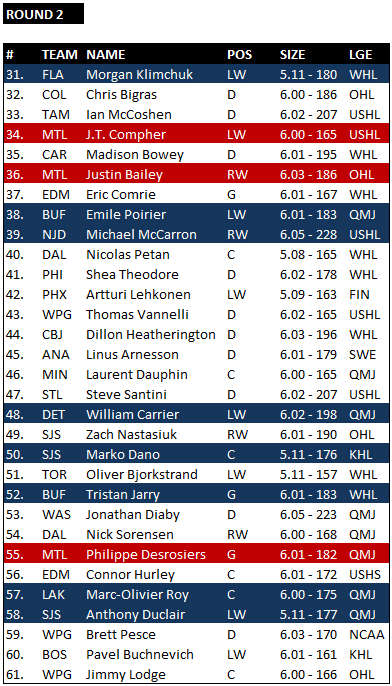 So with that, here's my mock draft with targeted players marked in blue and likely picks in red. As one of the oldest players in the draft, Mantha doesn’t use his 6.04 frame to his advantage nearly enough. Despite the fact he has above average speed and mobility with an excellent wrist shot that makes him a high percentage shooter, the concerns over his give-a-damn-quotient might be enough to drop him into trading range for Marc Bergevin to consider moving up. That’s assuming Trevor Timmins is convinced Mantha is more Max Pacioretty than Guillaume Latendresse. Despite playing a physical, two-way game with excellent skating ability and a high compete level; Lazar may slide into trading range on concerns about his ability to score goals at the NHL level. If the finesse continues to develop, his upside is a 2nd line winger but if it doesn’t, it’ll likely become a 3rd line checking center. A power forward with soft hands who can play a physical or finesse game who also might slide towards the Habs on concerns his scoring potential might be more in-line with a 3rd line winger. Erne’s skating has improved a bit and his willingness to drive the net is off the charts but ultimately, he may have difficulty reaching opposing nets with the puck in the NHL. An excellent skater with high-end puck handling ability and soft hands, Burakovsky may on concerns he’s struggled to produce in big games. He also plays too much of a perimeter game though adding 15-20 lbs. to that lanky frame would probably do him wonders. The skill is there to produce if he develops a consistent willingness to drive the net but he’s a risky pick because the NHL career ditch is full of talented players who couldn’t or wouldn’t make the adjustments needed to become a professional. Has what it takes to be a power forward in the NHL but with an excellent wrist shot and one-time ability, Rychel also has the potential to be a scoring winger. If his skating and defense improve enough, the potential is there to play top 6. While Gauthier has the size, skating ability and defensive awareness teams covet, he may slide because his offensive game may not translate well enough to be a 2nd line center in the NHL. He’s simply got to use his body more and take more shots on net to avoid becoming a 3rd line pivot in a shutdown role. Zykov has excellent puck possession skills and has shown willingness to battle in dirty areas for pucks. He combines soft hands with a willingness to drive the net but may slip on concerns over his skating. A solid, two-way player who brings a physical game more robust than his size suggests. Excellent compete level and hockey sense but likely destined for 3rd line duties as he probably won’t score enough at the NHL level to play top 6. Excellent hockey sense and willingness to compete but it’s his wrist shot and soft hands that provides top 6 potential if his skating improves. Good burst acceleration but currently lacking a top gear. A two-way center with good hockey sense and skating ability that seems ideal for a 3rd line role. Plays a gritty game to get opponents off their game but likely won’t score enough to play top 6. If Bailey can add 20+ lbs. to his 6.04 frame without sacrificing skating ability, his wrist shot is good enough to provide top 6 scoring potential. Needs to work on his defensive game and become more physical to get there. A solid two-way winger that plays a physical game but needs to keep working on his skating to be anything more than a 3rd line player. A physical beast with enough skating ability to play 3rd line minutes that may slip in the draft on legitimate concerns over his scoring ability, namely a weak wrist shot. Strong compete level and vision to go along with solid burst acceleration. Plays a good north-south game but likely won’t generate enough offense to be more than a 3rd liner. Solid two-way player with good hockey sense and a willingness to play more physical than his size. Excellent on the fore check, Dano’s lack of scoring ability means he’s probably destined for a 3rd line role. Plays a controlled, positional game but is also very athletic. Resume is small and that might scare some teams. Solid glove hand and plays the puck well but needs to develop confidence to challenge shooters more and must work on his rebound control. Jury is out on whether he has the mental makeup required be an NHL starting goaltender. An aggressive goaltender who doesn’t lack an ounce of confidence. Unlike Jarry, doesn’t hesitate to challenge shooters but must learn to be more selective. Not as strong as Jarry handling or tracking the puck but has the mental makeup to remain calm under pressure, which might make the difference becoming a number one goaltender teams can build around. Solid two-way player with good vision and playmaking ability. Roy has excellent burst acceleration and a top gear to help generate offense but needs to get much stronger to make the NHL. A high risk/reward project if there ever was one. A shoot first mentality with NHL grade acceleration and top end speed, Duclair has the potential to be a steal if he learns to use those around him more and improve defensively. Consistency will decide if he’s a 2nd line sniper or 3rd line counter-puncher.